Joshua Winslow "Josh" Groban (born February 27, 1981) is an American singer, songwriter, musician, actor, and record producer. He has won awards. 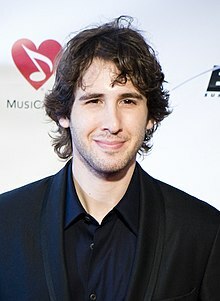 Groban was born in Los Angeles, California. His parents are Lindy (nee Johnston), a school teacher, and Jack Groban, a businessman. He has a younger brother, Chris, who shares the same birthday, but four years younger. Groban's father was born Jewish, and is a descendant of Russian and Polish immigrants; he converted from Judaism to Christianity when marrying Groban's mother. Groban's mother's ancestry includes Norwegian (from Toten), German, and English; one of her own grandfathers had been Jewish. Groban's parents are Episcopalians. Groban debuted as a singer in the seventh grade. ↑ "Monitor". Entertainment Weekly (1248). Mar 1, 2013. p. 25. ↑ "That Josh Groban Guy". That Josh Groban Guy. Retrieved 2014-01-07. ↑ Thrills, Adrian (January 5, 2007). "The popera boy struts his stuff". Daily Mail. London. ↑ 4.0 4.1 "Dave 'Til Dawn". Groban Archives. 2002-12-13. Retrieved 2014-01-07. ↑ "Josh Groban – Biography". Biggeststars.com. Retrieved 2014-01-07. ↑ Cidoni, Michael (January 21, 2008). "Josh Groban to sing at Sundance festival". USA Today. Retrieved January 7, 2014. ↑ "Josh Groban article". Grobanarchives.com. 2006-11-07. Retrieved 2014-01-07. ↑ "Megan Smolenyak: 10 Things You Didn't Know About Josh Groban's Family Tree". Huffingtonpost.com. Retrieved 2014-01-07. ↑ "Bio". AJT Enterprises. Joshgrobanlive.com. April 12, 2008. This page was last changed on 31 August 2017, at 05:07.